This SoundPack gives you the complete sound solution to part two of this epic adventure. Set in New York, your players will explore this rich world with a fully immersive background sound and music matched scene by scene to the adventure. Soon Nyarlathotep's plans will come to fruition. Then the world will be changed irrevocably — but not quite yet. Pesky human investigators have learned much. Now they must survive long enough to make sense of what they know and take resolute action. Masks of Nyarlathotep is a Lovecraftian exercise in horror and mystery. 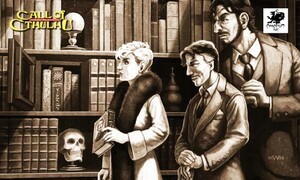 This Call of Cthulhu roleplaying classic is a series of linked adventures forming one long and unforgettable campaign. Horrifying deeds and dangerous sorcery dog those who dare attempt to unravel the fate of the Carlyle Expedition. Give it a try you won't regret it! Is this Adventure SoundPack useful when I'm not the actual Masks of Nyarlathotep Adventure? * and so much more. Masks of Nyarlathotep © 2017. Chaosium Inc.
Background and product art supplied by Chaosium Inc.